Guys, don’t worry, a good skincare routine doesn’t have to be a complex one. You can certainly look after your skin while maintaining a simple skincare regime. In this day and age, it is becoming more and more common for you guys to take pride in your appearance, yet sadly there is still a negative slur around it that’s causing lots of you to hide the fact that you’re taking care of your skin! YOU SHOULD BE PROUD! Following these simple steps will kick start a long & happy relationship between you and your skin. After all, you’re in this skin for life so you may as well feel confident in it right? Begin the day with a good cleanse as a dash of cold water does more than wake you up. Say goodbye to dead skin cells that make your face look dull and say HELLO to a brighter complexion. Drinking plenty of water will assist in keeping your skin hydrated from the inside. Even if you’re in your 20s (and still get ID-ed) now is the time to start preventing! By simply adding a retinol cream to your daily routine this will help the appearance of fine lines and wrinkles down the track, and guess what? We have lots in stock here at La Peau Beauty Therapy. Sleeping helps your cells recharge and recover, so having the recommended 7-8 hours every night really does work wonders. Keep your nutrition high by eating antioxidant-rich fruit and vegetables, healthy fats from oily fish and nuts, and a varied, balanced diet. This should give optimal levels of the nutrients that are crucial for glowing skin, including beta carotene, vitamins C and E, zinc and selenium. These are basic steps you gentlemen can follow, however here at La Peau Skin Rejuvenation our skilled therapists are here to assess your needs and tailor a specific regime just for you. GERnétic: The revolutionary alternative skin care brand! Introducing a skin superhero.. Avocados! 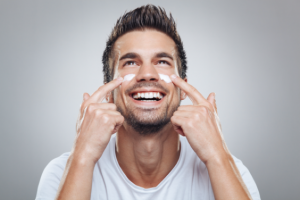 Gentlemen – Your skin matters too!